For every action there’s an opposite and equal reaction. For every action your team of Desert Rangers takes, there’s another action they don’t – or worse yet, an action your adversary takes. For every skill you choose to develop, there will be one you didn’t. For every path you take there will be one you missed. That, in a nutshell, is the very essence of Wasteland 2: choices and their consequences. You begin the game by creating your squad, Desert Ranger Team Echo, either by creating up to 4 rangers from scratch or by picking pre-made characters (which you can fine-tune if you want) from a fairly wide selection. Obviously, I chose to make my own rangers, which turned out to be a lengthy process as each ranger has attribute points to spend, weapon skills, knowledge skills and other general skills that all seem useful to some extent. The key here is creating a squad of rangers who complement one another and able to face any challenge thrown at them, as well as a guy who can repair toasters (yes, that’s a skill). In the end I went with a fairly traditional squad consisting of a dedicated sniper who, apart from a very rudimentary knowledge of weaponsmithing, can’t do much more than put bullets into people from a safe distance. He was quickly joined by an assault leader handy with a medkit and two close-combat specialists: a shotgun-wielding demolitions expert and a smooth-talking nun with a submachine gun (habit and ammo bandolier included!). You can go as far as choose each team-member’s religion and the brand of cigarettes he or she smokes to add a bit of a personal touch. My team are all non-smoking Buddhists (yes, even the nun). After the introduction movie and dialogue, Team Echo receives their first mission: find out what happened to another ranger by the name of Ace who was found murdered while on a fairly routine and low-risk assignment. I barely got my bearings when the first real choice presented itself: Two different settlements are under simultaneous attack by different enemies – and I can only help out one of them. Do I save the larger trading community and the region’s leading water supplier or do I save the research facility working on improving crops and feeding the population, Desert Rangers included? Without spoiling it for you, let me just say this: No matter which one you choose, you will have to face the consequences of your actions. While performing the tasks needed to save one settlement, the other settlement was constantly begging for assistance in an ever-worsening situation, until eventually the link goes dead. This is the first lesson of the wastes: You can’t save everyone, no matter how hard you try. Your team’s non-combat skills also play a major role in the way you approach the various challenges set before you. Even something as simple as a locked door will often have multiple approaches: Do you pick the lock? Find a key? Take a detour? How about you just blow it clean off its hinges? Even walking away is an option. 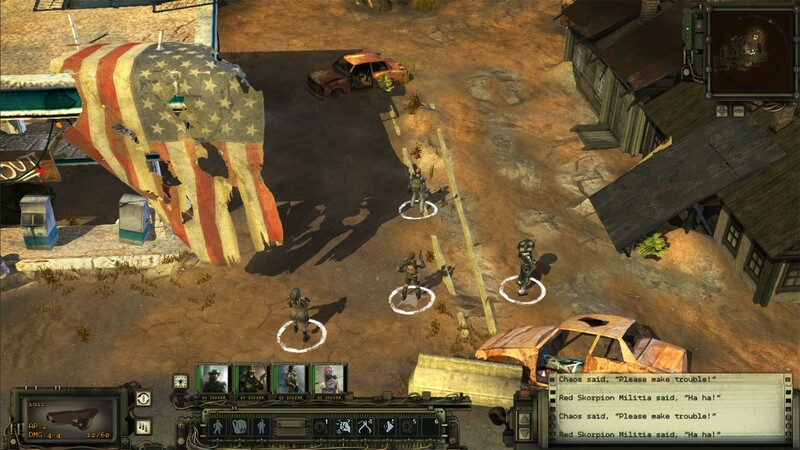 Wasteland 2 is built around the idea that no team, no matter how finely-tuned, will be able to do everything and see everything – Wasteland 2 is practically built to be replayed. Do not worry if your don’t have a ranger clever enough to persuade that one villager to tell you how to approach the enemy camp undetected – you’ll get it next time. And while your rangers may not be too good with words, they have the required skills to improvise their own entrance. In the end, it balances out. Honestly, it was this way when we found it and we totally did not just use a robot to blow up your turrets. It was those other guys. We’re just selling these fine leather jackets. No matter the approach you take or the choices you make, the game has a constant feel of progress and response. You are never at a point where you have nothing to do – you are always “on the job”, always moving forward in the main storyline or towards one of the many side-missions scattered around. Experience points trickle at a constant rate outside of combat as well, since using your skills always has an XP reward attached and you never find yourself doing something for nothing. In fact, about halfway through the game, my lock-picking safe-cracking ranger was about half a level above the rest of the team simply because no stone was left unturned and no lock left unmolested. 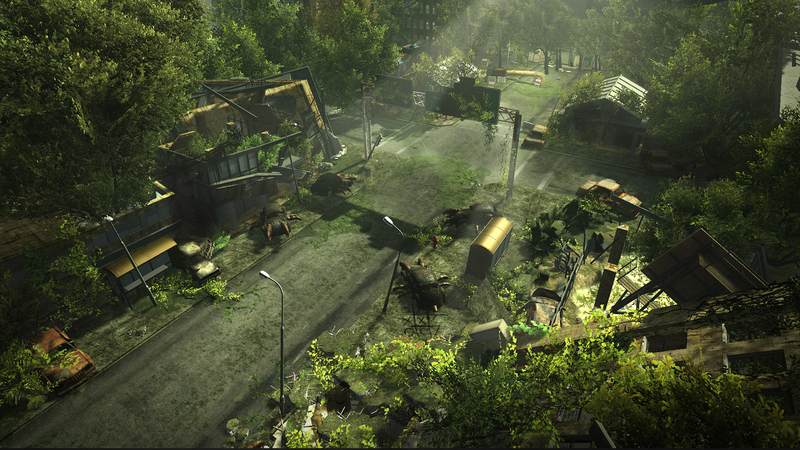 Wasteland 2 still has some quirks keeping it from being perfect. There are certain gameplay bugs that pop up on occasion – they’re not game-breaking but it was quite annoying when one of my rangers burst-fired her assault rifle from cover only to hit herself with all 3 rounds, nearly dying in the process. Some quests don’t give you proper directions or instructions as to what it is you’re supposed to do and you have to pay a lot of attention to the most minute details to advance. Some segments also feel needlessly complicated when you go through them – towards the end of the first half of the game, for example, a certain faction leader’s attitude towards me was quite hostile because of combat encounters I could not avoid. These are all small things, though – they’re not enough to ruin your enjoyment of the game but some more polish is definitely required here. Because you need to pay a lot of attention to detail, Wasteland 2 goes to great lengths in its descriptions. Practically every NPC you talk to is described, every building and every location is given descriptions of varying lengths – these descriptions set the mood well and do wonders for immersion. You will automatically check your weapons are loaded when you see corpses hanging from an overpass even without anyone saying anything, it’s just the right thing to do and you know it without the hand-holding that is typical to modern games. Your companions (should you choose to have any) will also add a lot to the story, especially if you visit places they’re familiar with. This lack of hand-holding might make the game a bit more difficult to beginners – at least in the early stages. Before your team really grows into itself and learns to work as a cohesive unit, expect to mess up quite a bit and possibly lose a ranger or two in the process of learning. 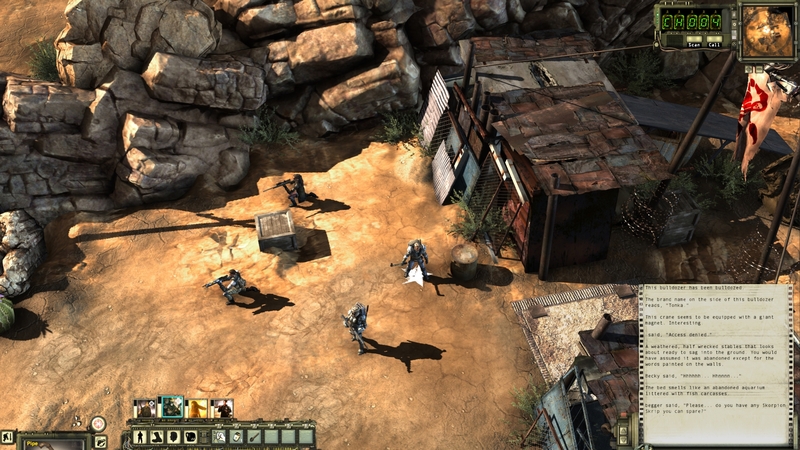 Because death is permanent in Wasteland 2, it’s not that easy for a ranger to completely die (even a level 1 surgeon skill and the right item is enough to save a ranger from dying) but even if they do, you can always have replacements in the form of NPC party members which you can find in all sorts of places. On top of that, the game’s difficulty can be adjusted at any time – in fact, I strongly recommend you start at the lowest setting if you’re new to the genre or just unsure of how everything works together. You can always bump it up later once you feel more secure in your abilities. It has been quite a while since I found a game that was so easy for me to recommend, but Wasteland 2 is definitely one of those rare gems. It is an excellent game that should be played (and replayed) by everyone – even if you’re not usually an RPG fan, give the story and world a chance and they will draw you in like very few games do.